It’s 4pm in San Francisco. The repetitive sound of tap shoes hitting a thick piece of plywood is blended with the blaring chimes of the cable car’s bell. You’re standing on the curb of Powell and Market texting a friend while waiting for the “walk” signal to appear across the street. The stranger to your right moves uncomfortably close to your purse. When you shift slightly to your left to lean away from him, you’re narrowly clipped by a speeding Muni bus passing by. The step you take backward to avoid the bus bumps you into the stranger standing behind you. The bump knocks your phone out of your hand. It falls to the ground, cracking and blacking out its screen. A number of expletives come to mind as you bend down to retrieve your phone, and passerby moves past you to cross the street. At this moment, you’re reminded of the money you just spent on bills and how complicated life will be now that you are temporarily “disconnected” without your phone. In the span of approximately 3 minutes, you’ve become extremely stressed. For many of us, the above situation can be found on the laundry list of challenges we endure on a daily basis. Stress occurs in various areas of our lives, having adverse effects on every area of our well being. Sadly, many of us are unable to take time away from work to manage our stress. For those who have employers that don’t offer benefits, paid vacation and sick leave are luxuries that are out of reach. But, it can be comforting to know that options exist for those who need to work long hours, and have limited time to relax. Yoga, meditation, running, or massages are the usual go-to wellness rituals. These are all well known, traditional methods to assist with stress reduction and aid with relaxation. One wellness practice that is reasserting itself as a cultural mainstay is floatation therapy. Floatation therapy has been around well before many of us were born. But it has steadily become a more reliable source of wellness benefits in recent years. In as little as 30 minutes, you can feel a sense of relief provided by floatation therapy. If you are unfamiliar with flotation therapy, here is a quick history – A former physician, neuroscientist, psychoanalyst, psychonaut, philosopher, writer and inventor, John C. Lilly, is the inventor of the sensory deprivation tank. While working at the National Institute of Mental Health in 1954, he created the first sensory deprivation tank (aka isolation tank). The tank was filled with salt water, allowing its occupant to float for an extended period of time. With the door closed, the tank was completely soundproof and dark, creating the sensory isolation experience. Through his invention of the tank and his research of the brain and consciousness, floatation therapy was born. Floatation therapy has been reported to significantly decrease stress, anxiety, body pain, and depression. An improvement in sleep quality and optimism can also improve, in addition to mindfulness in one's daily life. These improvements are due to the somewhat altered state of consciousness experienced while in a flotation tank. When your brain doesn’t need to process external stimuli, your mind can achieve a deeper level of relaxation. It’s also mentioned the amount of Epsom salt in the water (typically a minimum of 800 pounds depending on the tank) that allows you float, assists with soothing minor pain and injuries. If the thought of being in an isolation tank for an extended period of time feels a bit disconcerting, you aren’t alone. This was my initial feeling before my first visit to a floatation spa. I have my bouts of anxiety, and I’m a self-diagnosed claustrophobic. The idea of being completely closed off from the rest of the world was both daunting and exciting. I was definitely on the fence about participating. But, I did a little research prior to my visit and decided to go with friends. During my research, I found a few helpful tips that prepared me for the spa. If you choose to remove your body hair, don’t do it immediately before your visit. Since I was planning to go to the spa, I made sure all of my “maintenance” was done the night before. It’s suggested that any hair removal is done at least 12 to 24 hours before your visit, due to irritation. Since I’m on the subject of hair, I wore mine in a really long braided style at the time of my spa visit. My concern was whether the weight of my hair would cause my head to sink while floating. After viewing a few websites, I found the only hair issues are those associated with freshly dyed hair. Sometimes hair dye can bleed and damage the pods. Another nugget of wisdom I found, was to be mindful of food and drink intake. I made sure not to eat, or drink too much before my float. I rarely drink coffee. But it was also listed as one of the pre-spa “no-nos”. It makes total sense and I would hate for digestion to interrupt my float. My “big” day had arrived. The waiting room of the spa was as expected – a front counter with a friendly staff member to greet me, a musical selection to create ambiance, and an endless supply of chilled, cucumber-infused water. Once in my room, I was able to take it all in once the spa attendant had left. The shower and sink were unassuming and on one side of the room. The art on the walls was initially unnoticed because of the shape and size of the pod. It occupied half of the room. The moment I saw the pod I was transported back to my childhood. It looked as though creatives from Star Trek and Mork & Mindy collaborated on its design. The hatch was open. And inside its egg-shaped body, a rhythmic light show was taking place with the colors blue, purple, and green. The slow rotation of color did assist with calming my jitters. The temperature of the water was perfect. Once inside, it took a few minutes before I felt comfortable enough to close the door and lay in complete darkness. I had to work hard to not splash myself in the face with water. Although they provided me with a towel for my face, my first instinct is usually to wipe with my hand. While floating, I began to relax. But It felt different. A peaceful rush came over my body, and I no longer had any compelling thoughts or anxiety. At some point during my 60-minute session, I fell asleep. When my session ended, I exited the pod. I felt a “lightness” that wasn’t there before I arrived at the spa. The artwork on the walls stood out more, and I felt soothed from head-to-toe. My first session went so well, others followed. Most float spas provide you with the necessary toiletries and bath accessories. It’s not always necessary to bring your own items. A quick phone call to your spa or a search of the spa’s website should provide you with this information. I chose to bring my own. Because I have sensitive skin, I’m a fan of Annmarie’s products. Showering with the Rosemary Peppermint Body Wash, followed by the Coconut Body Oil to moisturize (it doesn’t leave my skin oily), left me feeling even more refreshed after my float visit. The scents of the products are so soothing. The best piece of advice I can give to a person experiencing float therapy for the first time – try it. When you finally step into your pod (or tank), allow yourself time to adjust to the sensation of floating before completely closing the pod’s door. I found it difficult becoming familiar with the feeling of floating, while in complete darkness. Lastly and most importantly, close your eyes and just relax. 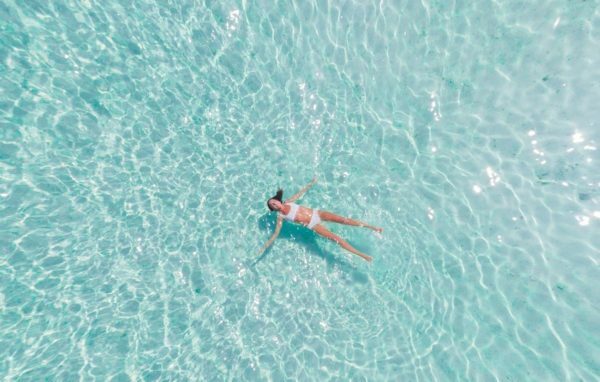 Have you tried flotation therapy? Let us know in the comments below!